Kibbutz Ma’ale Hahamisha was founded In the Jerusalem Hills in 1938, as part of the Tower and Stockade settlement development method in pre-State Israel. If features some lovely buildings, worth viewing, and if you traverse the kibbutz on foot you’ll be able to enjoy a short, wonderful hike through the woods leading to Ruti’s Garden. heroes of the Warsaw Ghetto uprising and it was sculpted by Artist Endre Révész in 1961. Hahamisha. Follow the signs on the kibbutz, directing you to the dining room. This impressive building, designed by Architect Arthur Goldreich and inaugurated in 1970, served as the kibbutz dining room until 2005. Since then it has been functioning as the kibbutz community center. cultural center for Kibbutz Ma’ale Hahamisha members and was named after kibbutz member Tsila Cohen Rotblit, who was murdered in 1945 in an attack while she was accompanying a group of young girls on a hike at Masada. The most important item of value nowadays in the building, is the huge fresco, which covers three walls. The painting, which is 15 meters long, was created in the 1950s by Artist Sey Shoenberg. This work is viewed today as one of Israel’s largest, most impressive frescoes, with some calling it a unique masterpiece. Highly recommended to see it sometime during your stay at the Yearim Hotel and your visit to Ma’ale Hahamisha. Return to the Yearim Hotel the same way you came. 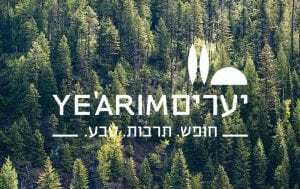 Yearim Hotel sits atop one of the highest peaks in the Jerusalem hills, fully immersed in nature’s charms. Your stay will take you on a journey through history to the most pure, unchanging corners found in Israel. © All rights reserved to Yearim hotel.